THE CEO OF Tesco has said that the grocery retailer will take action at Christmas time to stockpile food unless the UK government agrees a Brexit deal that ensures goods flow freely between Britain and Europe. Dave Lewis was speaking as Tesco unveiled its results for H1 2018, with its purchase of wholesaler Booker helping to support its underlying performance while first-half net profits sank. Profit after tax slumped 32% to £426 million (€479 million) in the six months to the end of August, Tesco said in a results statement. That compared with £628 million in the same part of the previous year, which was boosted partly by a large gain on the sale of its Korean operations. Speaking earlier, Lewis said that Tesco was cutting prices already as consumer confidence has taken a dive over the potential impacts of Brexit. “The possibility of stockpiling fresh food is very, very limited,” he said, adding that the impact of a no-deal Brexit on deliveries of fresh food from Europe would be the “single biggest challenge”. Lewis added that stockpiling of dry goods could be possible at Christmas time, as Tesco is engaged in discussing contingency plans with its suppliers. “It really is a wait and see,” he said. 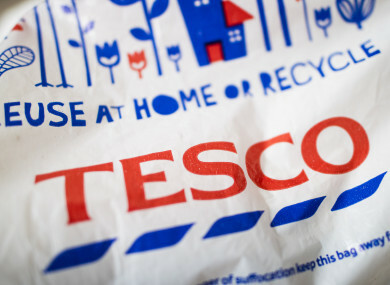 In its results, Tesco said that its latest underlying operating profit jumped 24% to £933 million, helped greatly by the recent acquisition of British wholesaler Booker. However this figure undershot analysts’ consensus forecast, contributing to Tesco’s share price tanking 8.3% to 215.70 pence on London’s benchmark FTSE 100 index, which was up 0.4% overall. Sales on a like-for-like basis, which strips out the impact of new floor space, climbed 2.3 percent in the second quarter. “We have made a good start to the year,” Lewis added. He added that the second quarter was driven mostly by solid performance in the UK and Ireland. Tesco bought Booker for £3.7 billion earlier this year, in a radical repositioning of the UK retailer that has been troubled in recent years by an accounting scandal – and fierce competition from supermarket rivals and discount chains. Booker is Britain’s the country’s biggest cash-and-carry operator and sells goods to more than 503,000 customers – including grocers, pubs and restaurants across the country. Tesco meanwhile recently launched a rearguard action against German-owned discounters Aldi and Lidl with the launch of discount food store chain Jack’s. The British supermarket giant has additionally finalised a purchasing alliance with French titan Carrefour to increase their leverage with suppliers – and enable them to slash prices on the supermarket shelves. Email “Tesco CEO warns it could stockpile food for Christmas time in UK if there's a no-deal Brexit”. Feedback on “Tesco CEO warns it could stockpile food for Christmas time in UK if there's a no-deal Brexit”.